What size dumpsters do you have and how big are they? What happens if I overload the dumpster? What if I need to reschedule a pick up or delivery date? Is there an extra charge for using a credit card? Can you pick up the dumpster later the same day it was dropped off? How soon can you deliver dumpsters? How do I pay, and do I have to be on location for delivery? What can I place in the dumpster? Do you recycle concrete, metal or yard waste? 1) How full can I fill the dumpster? Level with the top and nothing protruding from the sides so that our tarp system can properly cover the load, as required by law. 2) What size dumpsters do you have and how big are they? 3) What happens if I overload the dumpster? Driver may not be able to pick it up and/or additional charges may apply. 4) If I have a problem or need to reschedule a pick up or delivery date? Please call our office on 302-737-4030. 5) How long can I keep the Dumpster? Our standard rate includes a 30-day rental period. Daily rental fees will apply after 30 days until the container is removed or switched. 6) Is there an extra charge for using a credit card? 7) What are your operating hours? Delivery and pickup times: Monday thru Friday 7:00 a.m. to 5:00 p.m.
8) Can you pick up the dumpster later the same day it was dropped off? 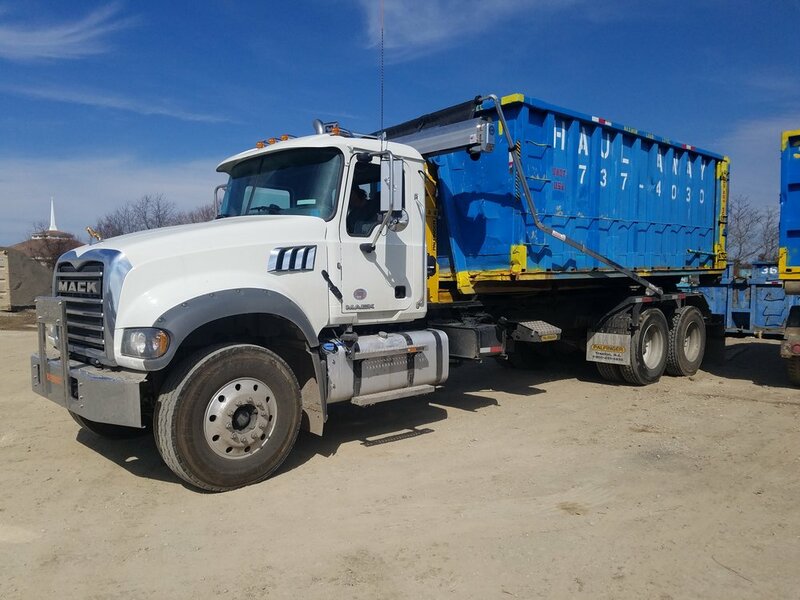 We can pick up the dumpster the same day if it’s been prearranged with our office. 9) How soon can you deliver dumpsters? Our standard delivery interval is Next Day Service as long as you call our office and schedule it before 4:00 p.m.
10) What if I need another dumpster? Call on us for a "switch". We will bring an empty dumpster and remove the full one. You will be required to pay the full price for the second dumpster. If you think you’ll need more than one dumpster, discuss this with our office when you call as volume discounts may apply. 11) How do I pay, and do I have to be on location for delivery? We accept all major credit cards (Visa, MC, AMEX or Discover). You do not have to be on location but if you will not be on site, it is best to place something like a cone, trashcan or small sign to help our drivers know exactly where you want the dumpster placed or give precise instructions to our office when ordering. 12) Can the dumpsters damage my property? YES. Our dumpsters have wheels on the rear that help them "roll-off" onto the ground. We would prefer to place the dumpsters on hard surfaces. Lawns may appear dry, but often with rain, the dumpsters and/or our trucks can sink into the ground. Asphalt driveways under the hot summer sun can have "divots" in them from the weight of the dumpsters. Often putting a piece of plywood down for the dumpster rails to sit on will cut down on possible scratching or scarring of driveways, or ruts in dirt. HAUL AWAY REMOVAL IS NOT RESPONSIBLE FOR ANY DAMAGE DUE TO NORMAL PLACEMENT, REMOVAL, OR RELOCATING OF DUMPSTERS. We will not cross other neighbors property lines without a signed "property damage liability waiver form" from the property owner. Our Drivers have the right to deny placement in areas that they deem "unsafe". Call us if you have questions or concerns on where to place your dumpster. 13) What can I place in the dumpster? Construction and demolition material (C&D) and Municipal Solid Waste (MSW or household trash) is acceptable. No hazardous materials whatsoever are allowed. Examples of hazardous material are: Asbestos, paint, gas/oil/propane containers, explosives, auto batteries, corrosives or anything labeled “hazardous”, “poisonous” or “flammable”. For a list of more hazardous material go to: http://www.dswa.com/FAQ_HHW.asp. White goods (refrigerators, ranges, freezers etc..) need to be handled separately and cannot be mixed with C&D or household trash. Trees, shrubs, stumps and other yard waste material cannot be mixed with C&D or household trash and must be the only thing in the container. Concrete and metal can be placed in containers but it’s more cost effective to separate and recycle them. Please call our office on 302-737-4030 for recycling rates. 14) Do you recycle concrete, metal or yardwaste? We do offer recycling services for concrete, metal and yard waste but the material has to be separated and not mixed with construction and demolition debris or household trash. Please call our office on 302-737-4030 for our recycling rates. MSW stands for Municipal Solid Waste. This is the trash you throw out everyday in your weekly trash pickup. This also includes some household furninshings. Call us at (302) 737-4030, or search the website below!